Rajkumar Hirani impresses once again but this time with Aamir. Drifting away from Sanjay Datt and Munnabhai, he gives us a visual treat. Though based on Chetan Bhagat's Five Point Someone, Hirani has adapted the story well to suit the sensibilities of the film audience. So, if you have read the book, you will enjoy seeing the fictional characters - Alok, Hari and Ryan come to life, though with different names - Raju(Sharman Joshi), Farhan(R Madhavan) and Rancho(Aamir Khan). And if you haven't read the book, never mind, you will enjoy the movie too(your mind free of predicting next scenes!). Best thing about Rajkumar Hirani's movies is the humorous way of conveying serious matters. That we have seen in Munnabhai MBBS and Lage Raho Munnabhai and 3 Idiots is no different. Most part of the movie makes you jump out of your seats and laugh out loud. But there are also scenes which makes you bring your hands closer for an applause. If Munnabhai MBBS asked the doctors to be more humane in their treatment to patients, 3 Idiots asks us to be thoughtful when making career choices and do not succumb to pressures from various quarters. If we are not passionate about engineering and choose it, we will become those reluctant engineers. For Aamir, I thought this is an extension of what he had conveyed in Taare Zameen Par - one should follow his heart and excel in the work he loves. Film also mocks the education system, which sets a rat race among the students for jobs. We can also spot some more similarities with Munnabhai MBBS. All Is Well mantra is to 3 Idiots, what Jadu Ki Jhappi was to Munnabhai MBBS. Prof.Viru Sahasrbuddhe(Boman Irani) reminds you of Dr.J.Asthana of Munnabhai MBBS and Rancho(Aamir) appears as a gentle version of Munna(Sanjay Datt). In this film, Hirani has retained the term Imperial in college name - Imperial College of Engineering just as in Imperial Institute of Medical Sciences in Munnabhai MBBS. One more thing I noticed in this movie is how well the director has connected the minute details in the film. I dont want to the give the details of the same as you will definitely find this out while watching the movie. This movie may not herald a revolution in India in terms of career selection but defintiely will provide some food for thought for those parents who have only 2 career choices for their kids - Medicine or Engineering. Must watch for all age groups. Worth every rupee. Hearthrob of Karnataka, Ganesh is back with his latest flick Maleyali Jotheyali. And this time, he looks to pass behind him, the poor box office records of his recent films. Plot : Preetham(Ganesh) comes to Sakaleshpur to escape from his father who wants him to get married soon. On the way to Sakaleshpur, he meets two girls Anjali(Yuvika Choudhary) and Sandhya(Anjana Sukhani). Anjali is an introvert and Sandhya, the opposite. In order to impress Sandhya, he takes the help of Anjali. In the process, both Sandhya and Anjali start liking Preetham. Equations change when Preetham realizes that he is in love with Anjali. Though there is nothing new in the sript and it is a plain triangular love story, there are many reasons for you to like the movie. Ganesh impresses with his spontaneous dialogue delivery and is touchy in emotional scenes. Another impressing act is of little girl Lucky, who befriends Preetham and both share their sorrows and happiness. Though you might have scene some of the best locations in Western Ghats in Mungaaru Male, there are some more for offer here. Comedy combo of Ganesh and Sharan makes you laugh loud. The same jodi had proved their worth in Krishna. Ganesh has sung a song in this movie - HaaLaad HaaLaad Heartali Hosa Hudgeer HaavaLi - mocking his act of Devdas in Mungaaru Male. There are few glitches in the movie like that of stereotyped role of father for Rangayana Raghu. Colonel Thammaya(Dattatreya) reminds you of Colonel Subbayya in Mungaaru Male. But a fast paced script covers up these glitches. Even then, I thought climax of the movie could have been different. Anyway I give thumbs up for this Preetham Gubbi venture. Rain and greenary are once again a treat to the eyes. Have a enjoyable time watching Maleyali Jotheyali. 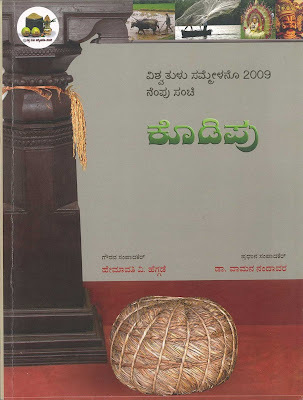 KODIPU is a Commemorative Volume of Vishwa Tulu Sammelano - 2009 held at Ujire, Dakshina Kannada comprising of articles on Tulu language, literature and culture. I am very happy to note in KODIPU, my blog www.raveeshkumar.com gets mentioned in the article - Namma Tulu on the Global Platform written by Yogitha Shetty, Mysore. Check out page No.219 of the KODIPU for details. 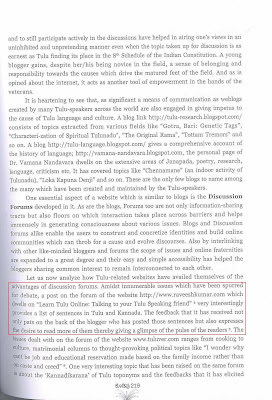 This is what the article has to say about the blog - "Amidst innumerable issues which have beeen spurred for debate, a post on the forum of the website http://www.raveeshkumar.com which dwells on 'Learn Tulu Online: Talking to your Tulu Speaking friend' very interestingly provides a list of sentences in Tulu and Kannada. The feedback that it has received not only pats on the back of the blogger who has posted those sentences but also expresses the desire to read more of them thereby giving a glimpse of the pulse of the readers." Probably, Tulu grama at Vishwa Tulu Sammelano 2009 in Ujire attracted more number of visitors. Tulu grama, spread across 8 acres of land in Ujire was called Ajjara Kallu. It refreshed my memories about the professions people were involved, some 10-15 years ago in most of the villages in Dakshina Kannada. On the whole, Tulu grama was representative of the adminstrative setup of Tulu village some time back. Few snaps of Vishwa Tulu Sammelano 2009 held at Ujire, Dakshina Kannada from 10th 13th December 2009. A comedy movie, as projected by the posters of the movie, Ajab Prem Ki Ghazab Kahani lives upto the expectations. Movie is fast paced and never seems boring. Rajkumar Santoshi is aware that primarily it is a comedy movie and he puts limited emotional scenes and it gels well. Few scenes here, may remind you of the great comedy movie of the 90s - Andaz Apna Apna. Plot : Prem(Ranbir Kapoor) is the president of Happy Club of the town, which he runs along with his jobless friends. The motto of the Happy Club is to keep the people of the town happy. His gang of men also help in uniting the lovers, when faced opposition from their parents. Jennifer(Katrina Kaif), who initially mistakes Prem for a kidnapper, later becomes his good friend. He does everything to win over her - turns into a non-vegetarian from being a pure-vegetarian, finds himself a job, does his work sincerely, keeps aside time for his family to get himself the tag of achcha ladka from Jennifer! But all this goes in vein as Jennifer is in love with Rahul(Upen Patel). In the meantime, Jennifer's parents are adamant on marrying her to someone else. But Prem comes to Jenni's rescue as the befitting president of Happy Club! But there are complications as Rahul's parents are also against him marrying Jenni. Will Jenni marry Rahul? What will be Prem's fate? To know answers to these questions watch the movie. Kahani is not so ajab as you might have seen this type of triangular love stories before but definitely the comedy element is ghazab and that proves poora paisa vasool! Funny dialogues for most part of the film keeps audience in good homour. Few comedy sequences are - Stammering by Ranbir and Katrina, when they get emotional. But this creates funny misunderstandings! Salman Khan does a cameo and the best part here is when Ranbir hesitatingly introduces Katrina as his girl friend, Salman says why are you acting as if you are introducing my girl friend as yours! Prem turns into a non-vegetarian without knowing Jenni is a pure vegetarian! Prem's confession to Lord Jesus in broken English also tickles your funny bone. Comedy of errors in the party, when Prem is eager to dance with Jenni sets a laugh riot. Beautiful landscapes of Ooty, where the major portion of the film was shot, are a treat to watch. Ranbir Kapoor and Katrina Kaif make up a good onscreen pair. Fight sequence which is at the final part of the movie seems dragged. Climax of the movie well dealt, though in an unusual way. On the whole, this film is a complete entertainer. So, surely make up your time to watch it. Sowthadka Mahaganapathi Temple, 20km from popular pilgrimage center, Dharmasthala in Dakshina Kannada, is unique in the sense that it has no temple structure. I am not aware of any other temple for which there is no temple structure. This temple nestled in tranquil natural surroundings is open round the clock for offering prayers, with simple worshipping opportunity to the public. Devotees themselves have the opportunity to perform pooja to Lord Ganapathi. It is not crowded as most of the popular temples are. With lush greenery around and Lord Ganapathi in middle of it, this place is ideal for meditation. If you are looking for calm, serene surroundings, this is the place for you. Well, I see these settings continuing the ancient Indian tradition of worshipping the nature. One can also see a lot of cows freely wandering around the place of worship. Monkeys can also be seen jumping from tree to tree. Prasada of the pooja is also offered to these animals. Thus, love towards animals is nurtured. Simplicity of this place is sure to delight you.There is also a park near the temple, where there is a statue of Lord Shiva. Bit of History : Long ago, a temple was in control of a Royal family. During one of the battles, the temple was destroyed. At that time, cowherds in and around this area took away the Mahaganapathi idol and started worshipping wherever they went and finally installing the idol here at Sowthadka. They were growing cucumber and during their worship started offering same to Lord Mahaganapathi of this temple. In Kannada, "sowthe" means cucumber and "adka" means meadow hence the name "Sowthadka". No temple structure has been allowed as per the traditional norms. 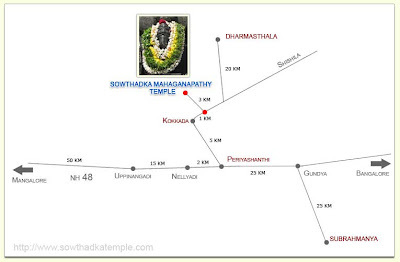 How to reach Sowthadka by Road: One can reach Southadka, on the National Highway 48(Mangalore-Bangalore) from Uppinangady towards Bangalore, first left turn after Nellyadi, on Dharmasthala Road. Update: 19th December 2009, For viewing the photos of Vishwa Tulu Sammelano 2009 please visit here. Vishwa Tulu Sammelano or World Tulu Convention in association with Sri Kshetra Dharmasthala and Karnataka Tulu Sahitya Academy will be held in Ujire near Dharmasthala from 10th to 13th December 2009. Before the Convention in December, talks/competitions/demos/exhibitions relating to Tulu language and Tulu Nadu will be held in several venues on the following dates. FYI : This is 200th post in Ee Prapancha. Much awaited Kannada film Manasaare got released today. Film begins with song Ondu kanasu just like in Gaalipata. Neethu who was paired up with Diganth in Gaalipata, has acted in a guest role here. Whether it was to bring back the Gaalipata chemistry(which was by the way well received by the Kannada audience) here too? That is the question, director of the movie has to answer. 15-20 minutes from the beginning of the film is a good watch with comedy sequences featuring Diganth. But, soon the jovial mood in the film turns into a serious one. This continues for rest of the film canvas with tinges of comedy here and there. Manohar(Diganth) is a jobless bachelor. He is in love with Bhamini(Neethu) but she deserts him for a well earning groom. Manohar being happy go lucky guy, never minds it. One night in Bangalore, Manohar is mistaken for a mental patient and taken away to a mental hospital in Malligepura in Kodagu. His efforts to prove himself sane prove futile. Even though he manages to escape from there, he comes back because of his love at first sight in the hospital on the day of escape! And now, he plans to elope with his lady love in the hospital van and of course, he succeeds too. Devika(Aindrita) who is also a mental patient, hates all men and her reaction towards them is to stab them. She, unaware of Manohar's motives tries to stab him, once she thinks that she has been kidnapped. She insists on returning to hospital and on her way back to hospital, spends 2 days with him and needless to say, love blooms. Also, Devika recovers to normal mental health. And now, when everything is going smooth in Manohar's life, hospital authorities come to know that Manohar is mistaken for Mahendra, another mental patient. This infuriates Devika, who thinks that Manohar is cheating her. Manohar is evicted out of the hospital and his future seems gloomy. Well, then Devika comes to know that Manohar is a good guy and they live happily ever after. Script as you might have realized by now is weak. Predictable sequences mar the interest of the audience. Also, songs seems to have been stuffed. In a 2 hour movie, you can imagine how difficult it is to put 7 songs. In a way songs tries to lower the pace of the movie, which is otherwise fast paced. Also, several sequences appear unnatural - like, it is quite easy to escape out of the mental hospital and come back again! Bride(Bhamini) confessing her love to other guy(Diganth), taking some time off from the wedding reception! Manohar's uncle wearing patient's dress and climbing hospital wall, to see his future daughter-in-law! Songs have been well shot but that solely, seems to be the success mantra of Gandhinagar nowadays. Diganth walks away with good performance. Dialogues in north Karnataka lingo are homorous and makes you laugh. Kudos to Raju Thalikote. At the end of the movie, I thought keeping only 3-4 songs with little more on-screen chemistry between Diganth and Aindritha would have made the film much better. What say, folks? To read the Kannada version click here. After Gaalipata, director Yogaraj Bhat is gearing up for the release of his latest venture Manasaare. Manasaare literally means straight from heart in Kannada. Here is a first look on the audio of the film released recently. Trinity of Mungaaru Male - Jayanth Kaykini, Mano Murthy and Yogaraj Bhat is back in Manasaare. Manasaare audio contains 7 songs. Except for one shloka in Sanskrit, lyrics for the remaining 6 songs is written by Kaykini and Bhat. 4 of them are slow tracks continuing the tradition of Mungaaru Male and Gaalipata - where majority of songs were so. ello maLeyaagideyendu tangaaLiyu hELutide(cool breeze is saying it has rained somewhere) is a solo sung by Sonu Nigam. Jayanth Kaykini seems to have hangover of Mungaaru Male. But well, that does seem only in the first line. Beautiful lyrics combined with Sonu's voice is a treat to listen. Glad to see Sonu pronouncing his Kannada correctly here. Music in the beginning of the song is amazing. Yogaraj Bhat has penned kaNNa haniyondige kenne maataaDide(cheek has a talk with tears) which has some new lines in lyrics and it is well sung by Shreya Ghoshal and Kay Kay. naa naguva modalEne(before I laugh), again by Bhat is also sung by Shreya Ghoshal. This song is yet another instance of Shreya's sweet voice. Manasaare's title track naanu manasaare maruLanaagE iruvenu innu munde(I will be crazy to my heart's liking from now on) is less of music and more of singing abilities of Vikas Vashistha and Lakshmi Nagaraj. This song with small duration of about 2 minutes and 40 seconds has the potential of becoming a hit just like Kavithe song of Gaalipata did. After the melodious tunes of the above mentioned tracks, onde ondu nOTa saaku(one look is enough), a fast track does not impress. ondu kanasu khaalee peelee kaNNa munde heege oDutirabEku(one dream however crazy must be running in front of the eyes like this) written Jayanth Kaykini was the first song I liked in Manasaare. Reason for the liking may be since it was the first song I heard from Manasaare. Kunal Ganjawala who has proved his mettle singing fast tracks in Kannada has lended the voice along with Ananya Bhagat and Earl Edgar. Finally, Vijaya Prakash of Jai Ho fame has recited the shloka - sahanavavatu sahanav bhunattu. I am curious to know in which part of the film, Yogaraj has used this song. Newspapers have announced the release of Manasaare in next few weeks. Lets wait for that. All in all, Manasaare is sure to steal the hearts of Kannada music lovers. To listen to Manasaare songs visit Kannadaaudio.com. Financial Expert, a novel by well known writer R K Narayan is a good read. Like most of his novels, R K Narayan tells the story with homorous touch. Plot: Story revolves around Margayya, who helps and advises poor villagers in getting loans from a Cooperative society. Before people getting loans allocated from the Cooperative society, he gives an advance amount for which he charges interest. These financial deeds are maintained in an accounts book by Margayya. Balu, Margayya's son is always upto some mischief. One fine day, in one of his playful acts, he dumps Margayya's accounts book into the gutter. Margayya is now unable to recover money from his clients as they insist on records in the accounts book. But Margayya earns wealth after various incidents like meeting up with Temple priest and Dr.Pal, a Socialogist. The events leading upto this is sure to tickle your funny bone. Dr.Pal is chiefly responsible for Margayya's success. Ironically, he along with Balu become responsible for Margayya's fall in the end. Film Adaptation : There are few films which do justice to a popular book. This book's film adaptation in Kannada - Banker Margayya is one of those few. Though one cannot fully depict what the character is thinking in a film as in a book, I am sure even if you had read the book, you will equally enjoy the movie. Director T S Nagabharana has given attention to the details provided in the book, which makes you like the movie. With Lokesh, one of the finest actors in Kannada cinema, as Margayya you are in for a visual treat. Read this article in Kannada here. 'Yegdagella Aithe' in Kannada means 'Everything is there in Yoga'. Kannada book 'Yegdagella Aithe' by Belagere Krishna Shastri is a memoir of Shree Mukundooru Swamiji. As the author says Swamiji used to use this phrase, 'Yegdagella Aithe' more often in his talks, hence the name of the book. Belagere Krishna Shastri is witness to several miracles performed by Shree Mukundooru Swamiji. While reading the book you may face questions like 'What? ', 'Whether it is real/possible?' Your logical mind, which is used to scientific explainations may refuse to accept the events described here. But, we having not seen such supernatural events does not mean that they are fake. Also, those phenomena for which we cannot give any scientific explaination just means those are the areas, which need to be explored. Even the author himself did not believe initially what people were saying about the miracles Swamiji performed. But if you keep your logical thinking aside and read Krishna Shastri's experiences as your own you will be amazed. In addition, there are instances in the book about how Swamiji used to explain ordinary people about spirituality using the language they understand better. In 1949, Krishna Shastri came to Devanooru village in Kadur taluk of Chikmagalur district to work as a teacher. There he met Swamiji and his interactions with Swamiji is the content of the book. Mukundooru Swamiji, who never wanted publicity, also remained modest of his miracles. He acted as if he had not performed those at all. In the book, there are sayings, idioms in particular dialect of Kannada which is common to malnad and surrounding regions of Karnataka. So, if you are not from these places, you may find it new/difficult. But even then, this book is a good read for an amazing spiritual experience.